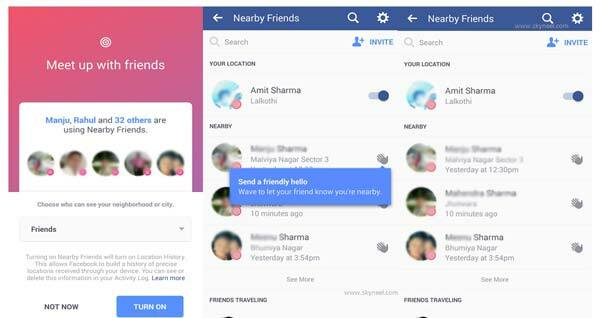 Nearby Friends feature on Facebook allows you to find your friend location when they are nearby. You can easily use Nearby Friends feature on Facebook at your smartphone.You can easily track your all Facebook friends real time location at your Smartphone. You can also quickly meet your nearby Facebook friends. Facebook is a very popular and free to use social networking website. It allows his registered users to create profiles, upload photos and video, send messages. Nearby Friends feature on Facebook shows you current location, distance between your other active Facebook friends, last seen and other features. You can also tap on the hello sign to meet your nearby Facebook friends. If you want send invitation letter to other Facebook friends then you must have to tap on the Invite option. Choose one or more Facebook friends in the list as per your need. After accept the invitation you can easily check your friends precise location on the map. If your Facebook friend nearby at your location then you can set the meeting location as per your conveyance. If you want to setup latest nearby friends feature on Facebook then you must have to take few given simple steps. Step 1: Download and install updated full version of Facebook at your Android phone or iOS. Step 2: After finish the installation login your registered Facebook account. Step 3: Tap on the three horizontal lines which is located at the top right corner. Now you will get list of different options in front of your screen. Scroll down the list of options and choose Nearby Friends option. To active the Nearby Friends feature at your device tap on Turn on button. Step 4: You can check the list of nearby Facebook friends. You can check the current location, distance, last seen. You can also send hello to your nearby Facebook friends by tap on the hand sign which is placed at the right side of active friends. You can also check complete profile of your Facebook friends, send and messages, images, videos. You can easily share your view or idea with your Facebook friends. I hope after reading this guide Nearby Friends feature on Facebook guide you can easily get correct location of your Facebook friends. If you have any suggestion regarding this article then please write us in the comment box. Thanks to all. How do I get notifications if someone is nearby?